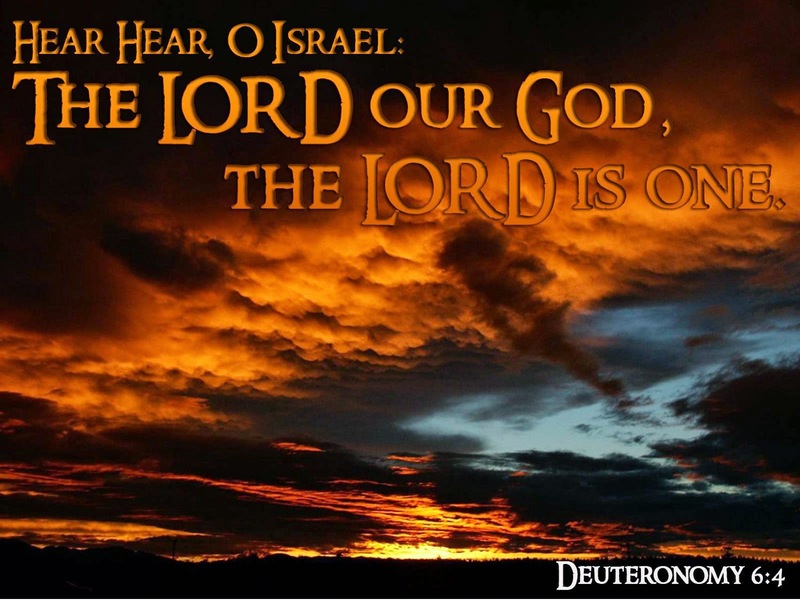 The Lord our God, the Lord is One." "Shema Yisrael YHWH Elohim (plural) echad (one) YHWH." "Hear, Israel, YHWH our God(s) One YHWH." “This is the most important... Listen, Israel! We have already shown in a previous article how the Hebrew word for "one" in Deuteronomy 6:4 is "echad," which refers, not to a numerical oneness but to a oneness of unity, much like a husband and a wife are one (see link below). This, in contrast to the Hebrew word, "yachid," which refers to a numerical oneness. We have also seen how the God of Abraham, Isaac and Jacob is the unlimited God of complex unity (see link below) Who is always able -- and willing -- to enter into His creation. He is the Almighty YHWH Who can take any form He wishes, even the form of a man. We have also listed in other articles a few of the multiple times that the word "Lord" is applied to Jesus in the very same way it is applied to the God of all creation throughout both the Old and New Testaments. In this article, we will take a look at yet another way in which the Bible teaches indisputably that Jesus is the very same God of Whom Moses wrote. In this passage, Paul contrasts the false gods worshiped by unbelievers (v. 5) with the One True God (v. 6). But then Paul goes on to describe Who that God is. "... yet for us there is one God, the Father. and we exist for the Father. 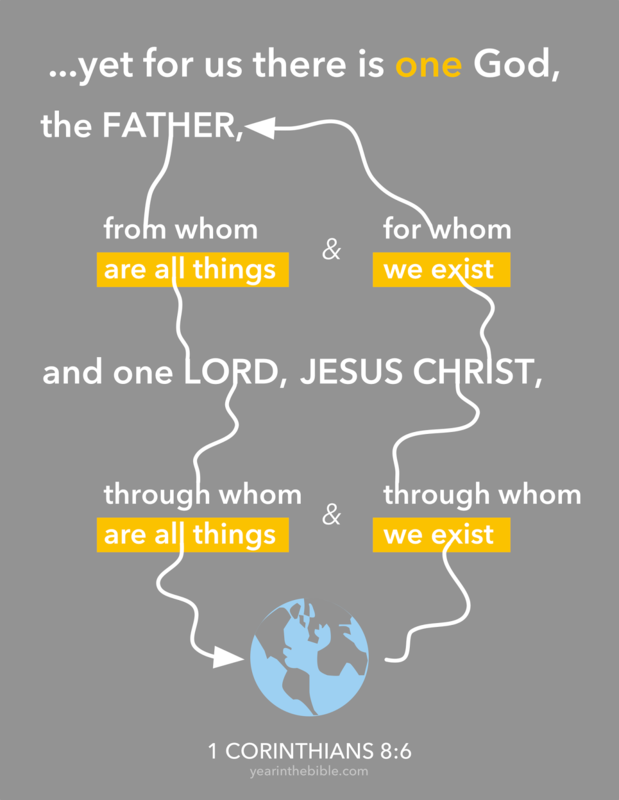 and we exist through Jesus." The Greek word "kurios" that is used here for "lord" is the same word that is used for God. While it can also mean "master," it is context that helps us to determine how to interpret it. "... there is one God, the Father. Anyone who believes in God should have no trouble accepting the top verses which state that all things are from God the Father and that we exist for Him. But if Jesus is not God, no one can say what Paul says here about Him. All things cannot have come, as in all creation, through a mere man. We, as in all humanity, cannot have come into existence through a mere man. So Paul states in our passage that Jesus is God, affirming what the Apostle John says in John 1:1-3. Now, this declaration of Jesus' deity from 1 Corinthians 8:6 alone is powerful enough as it stands, but scholars tell us that Paul is doing something else here which would have most definitely caught the attention of 1st century Jews. "akoue israêl kurios ho theos hemôn kurios eis estin." "all êmin eis theos ho patêr, ex ou ta panta kai hmeis eis auton, kai eis kurios iêsous xristos, di ou ta panta kai hmeis di autou"
Deut 6 "kurios ho Theos hemôn"
1 Cor 8 "eis Theos ho pater"
Deut 6 "kurios eis estin"
1 Cor 8 "kai eis kurios iEsous christos"
“... The Lord our God, the Lord is One." "One God the Father, and one Lord Jesus Christ." Where Deuteronomy 6:4 says "The Lord is our God..."
1 Corinthians 8:6 (and elsewhere) says Jesus is Lord, therefore Jesus is God. The Father is God. The Lord is our God. Jesus is Lord, therefore Jesus is God. Once again, this is the Biblical doctrine of the Trinity, in which the Father and the Son remain distinct Persons, and yet are One YHWH with the Holy Spirit. Paul's critics will note that, through this passage we have also seen that, when Paul wrote, he only affirmed what Jesus had already taught. If you still don't know Jesus as your Lord and Savior, He waits for you with arms open wide. Come to Him, that you may have life! With thanks to Dr James White for mentioning this on his podcast.